Applying to jobs has become more than simply filling out an application. Employers nowadays are starting to look for resumes, whether you're in high school or college. So, I figured I'd help you out with writing your own. Everyone has to do it sometime, so you might as well start now! 1. The first thing you need to do is to include your contact information. (See the example resume below to follow along with these steps.) You'll want to include your name, address, and phone number. This should be centered. 2. Second is your objective. This will change depending on the job you are applying for. It should be short and simple and say what you want to get out of the job while sounding professional. 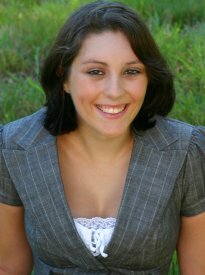 In the example resume, this person is a college student applying to a studio as a photographer. 3. Next should be your qualifications. This is a list of what you feel qualifies you for the job you are applying for. 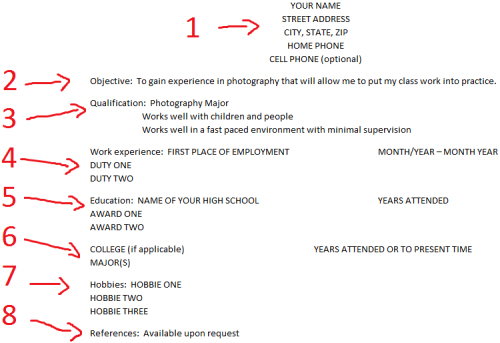 In the example resume, this person included that they are majoring in photography, as well as that they work well with all people and in a fast paced environment. Depending on the job, the last two items will be good to add. 4. After this is your education. This is simple enough. Include your high school and college, if applicable. You will need to include the years you attended each, awards you have won (such as high honors) and your major(s) and/or minor(s). 5. The "hobbies" step is optional, but is a good step to include if you don't have a very good resume or work experience. Typically, resumes should be a page long, so if you don't meet that requirement, throwing in your hobbies is a good thing to do. Employers look for active people who will be a good asset to their business, and listing your hobbies is an easy way to make you seem like a real person who enjoys being active in her life, and it will make employers interested in meeting you. 6. And last but not least, your references. Just like when filling out a job application, you need to list former co-workers or friends that employers can turn to, in order to get the 4-1-1 on who you are and how other people see you. Listing people you have a good relationship with will help. In the example resume, you can see that this person said "available upon request." You may also say this, though chances are employers won't even ask. And now, you have just written and completed your first resume! Send it in to employers, and good luck!